Network architects must implement infrastructures that support the business, are agile and flexible, and are cost effective. The cost factors should be demonstrable both in terms of cost/bit and operational efficiency. Major architectural changes happen very infrequently, but we are at one of those inflection points today, as IT infrastructure adapts to frequently changing business needs. This is the key factor for the proliferation of distributed data centers (no longer confined to four walls). And as more and more enterprises connect to cloud-based data centers, the bandwidth requirements are leading to the rapid adoption of 40Gbps and 100Gbps interfaces—much more quickly than the earlier migration from 1Gbps to 10Gbps networks. All of this is calling for more flexible (and/or higher-scale) fabrics, which is one reason why our IP Fabrics are gaining fast traction in networks both large and small. Brocade’s IP Fabrics are being delivered to both large and small enterprises, and service providers, in a very cost effective manner. In recent years, with the rise of VM-based applications and containers, application workloads have evolved to the point where the majority of traffic is no longer between clients and servers (so-called “North-South” traffic), but between the servers themselves (“East-West”). The agility requirements to support this are much higher than ever before: data center networks need to be able to recognize and communicate with any VLAN on any interface in any physical data center—truly creating virtual and software-defined data centers. This requires new technology and tools to support these design changes. Accordingly, data center networks continue their inexorable migration from traditional access, aggregation, and core architectures to Clos topologies, which facilitate the formation of fabrics that can handle these huge, distributed workloads. IP Fabrics, scaling to hundreds of thousands of servers, bring carrier-class flexibility and scale into the data center. One of the key advantages beyond the sheer size is that you can run overlay virtual networks to support multitenancy for thousands of users and applications. Extreme IP Fabrics provide a programmable base infrastructure that can quickly adapt to the ever changing needs of the business without reinvesting in new hardware. They leverage proven, open-standards protocols and deliver superior automation and scalability to address the rapidly changing requirements facing cloud data centers. Based on a cloud-proven, standard BGP-based design, these fabrics bring the best practices of mega-scale data center automation and expansion to any data center. Extreme’s IP Fabric solution is based on a simplified protocol stack, reliant only on Internet-proven IP and BGP (Figure 1). The key to an IP Fabric is that it supports all the aforementioned agility for networks of any size while being easy to use, understand, and operate. Because IP Fabrics are standards-based, many tools already exist for monitoring and troubleshooting. 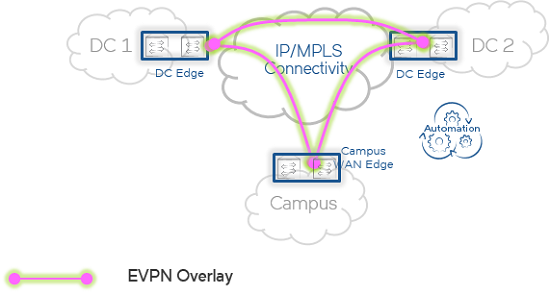 Data Center Interconnect (DCI) using BGP EVPN-VXLAN provides even more benefits for scale across multiple physical data centers (Figure 2). High level features and benefits of this solution are given in Table 1. BGP-EVPN connects groups of users using a virtual bridge by distributing MAC addresses in BGP updates. This provides non MPLS based MAC route distribution option, leveraging address families in multiprotocol BGP. The top benefit above means that enterprises can easily onboard tenants with overlapping VLANs and IP Subnets and can move workloads within and across data centers. In this era of MAC explosion (BYOD) and in terms of a VXLAN network identifier space, this architecture can scale to 16 million VLANs, as opposed to the 802.1q limit of 4096 VLANs. Why the Primacy of BGP? Speaking of BGP-EVPN, it’s worth noting that the world’s largest data centers continue to utilize it and to submit IETF drafts to enhance it. The use of BGP to build large fabrics is well tested and proven in networks to 100’s of thousands of servers as discussed in this famous 2012 NANOG presentation from Microsoft. Based on proven Internet success, our IP Fabric solutions leverage BGP because of its simplicity, interoperability, and traffic-engineering capabilities. Remember that BGP in the data center does not use all the complicated knobs and decision trees found in service provider networks. There’s a natural tendency for the IETF to find vendors pushing new solutions matched to their particular emphasis. These trends may be proprietary (self-serving), creative, or both. In many cases, these do not result in mass adoption, but only create different niche solutions that may not apply to most customers. If these recent efforts become fully baked (over the next couple of years), they may include some features that provide slightly quicker convergence times for selected hyperscale architectures at the cost of additional complexity and non-standard protocol implementation. Our IP fabrics leverage Workflow Composer, a DevOps network automation platform that enables turnkey automation for IP fabric provisioning, validation, upgrades, troubleshooting, and auto-remediation. Workflow Composer automates the entire network lifecycle to accelerate time to value and reduce operational costs. With Workflow Composer, IP Fabric and BGP-EVPN deployment times are reduced from days to just minutes. The automated provisioning of network devices and network virtualization (see Figure 3, illustrating a workflow to add or remove a switch from an IP Fabric) allows administrators to deploy services with minimal effort, out of the box. In observing the success of our customers, Extreme continues to recommend proven, open solutions based on BGP that support our IP Fabrics. For more information, see this solution brief on IP Fabrics. And contact your Extreme representative for more information. This post was originally published by Product Marketing Director Alan Sardella.